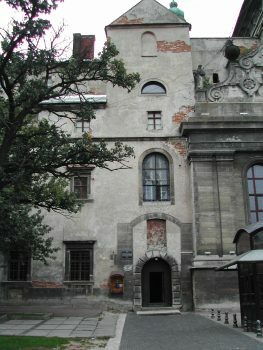 Most of the specifically Jewish records from Galicia held in Ukrainian state archives are to be found in the Central State Historical Archives in Lviv (TsDIAL)[ Централний Державний Історичний Архів України м. Львів (ЦДІАЛ)]. Fond 701, Series 1 of this archive currently consists of 420 books of Jewish metrical records from 63 towns, all but three of them in the eastern part of former Galicia, now in Ukraine. These books, from Fond 701/1, have been and continue to be the focal point of Gesher Galicia’s indexing project of metrical (vital) records for the eastern part of Galicia. A much larger set of metrical record books (again nearly all of them from the eastern part of Galicia) are found at AGAD in Warsaw, whose inventories of Jewish records can be viewed here. Series 2, 4 and 5 of Fond 701 also contain Jewish books – largely from the town of Lwów – though these tend to be mainly “community records”. They include the so-called “Family Evidence books,” financial records, and regulations of the community. Many of the books in Fond 701 were microfilmed by the Mormons (LDS) in around 2006. However, 23 books have been added to Fond 701/1 in recent recent years – either from an internal reorganization within the archive, or after being released for public access and transferred from a civil registration office. A number of Jewish vital record books from the town of Stanisławów (now Ivano-Frankivsk) can be found in the State Archive of Ivano-Frankivsk Oblast (DAIFO) [Державний Архів Івано-Франківської Області (ДАІФО)], in their Fond 631, Series 1, 2 and 3. There are also a vital record book and the Tarnopol Jewish census of 1910 in the State Archive of Ternopil Oblast (DATO) [Державний Архів Тернопільської Області (ДАТО)] in Fonds 32 and 33. Gesher Galicia has prepared a detailed inventory of the Jewish record books held in the state archives in Lviv, Ivano-Frankivsk, and Ternopil – including all the volumes that we are aware of. We have prepared this in two forms, the first arranged by towns, and the second by Fond, Series and Volume numbers. Those record books that are already indexed and available on the online All Galicia Database have been shaded in the inventories. ** For the inventory of Jewish records held in the state archives in Lviv, Ivano-Frankivsk, and Ternopil, and sorted by town name, click here. ** For the inventory of Jewish records held in the state archives in Lviv, Ivano-Frankivsk, and Ternopil, and sorted by Fond, Series and Volume numbers, click here.